The Patron Saint of Naples, as you may know, is San Gennaro. (If you don't, click on that link.) It is not unheard of to treat the subject of saints and miracles with humor, and no one takes offense at it. A good example is the late Massimo Troise, the Neapolitan comic whose classic skit of himself pleading with a statue of the saint for a winning lottery number made everyone laugh, presumably even San Gennaro, himself. Commercial exploitation, however, is another matter. Local Catholic organizations are upset at a recent poster that appeared in the Vomero section of town just before the feast day of the saint (September 19). San Gennaro was depicted holding up a CD. The music was a miracle! Buy this CD! The posters were posted where you shouldn't post, so the city had a good excuse to take them down, which it did. Your body is a temple, so maybe this is not so weird. There is a long history of churches and monasteries in Naples being converted to secular use; the city hall used to be a monastery, as did the Department of Architecture of the university and even a number of police stations and barracks. Small churches, as well, have wound up doing other things. This photo is of the inside of what used to be the church of Santa Maria a Cappella Vecchia, once part of a much larger complex, all of which has now been converted to both secular and muscular use. 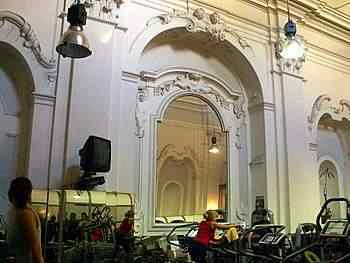 It is near Piazza dei Martiri and is, I think, the only old church in Naples that has been turned into a gym. You tend to walk by these two statues (See expanded entry: "The Russian Horses".) even though they are not, strictly speaking, out of the way or difficult to notice. They flank the never-open entrance to the gardens of the Royal Palace at the east end, right across from the Maschio Angioino castle. If at all, you might note that "they don't look very Italian." Indeed, they are not. These are the Horse Tamers by Russian sculptor Peter Clodt von Jürgensburg (1805-67) and are replicas of two statues on the Anichkov bridge over the Fontanka river in St. Petersburg. They were a gift from czar Nicolas I to Ferdinand II in 1846 on the occasion of a state visit by the czar to the Kingdom of the Two Sicilies. Neapolitans refer to the statues, simply, as "the bronze horses."